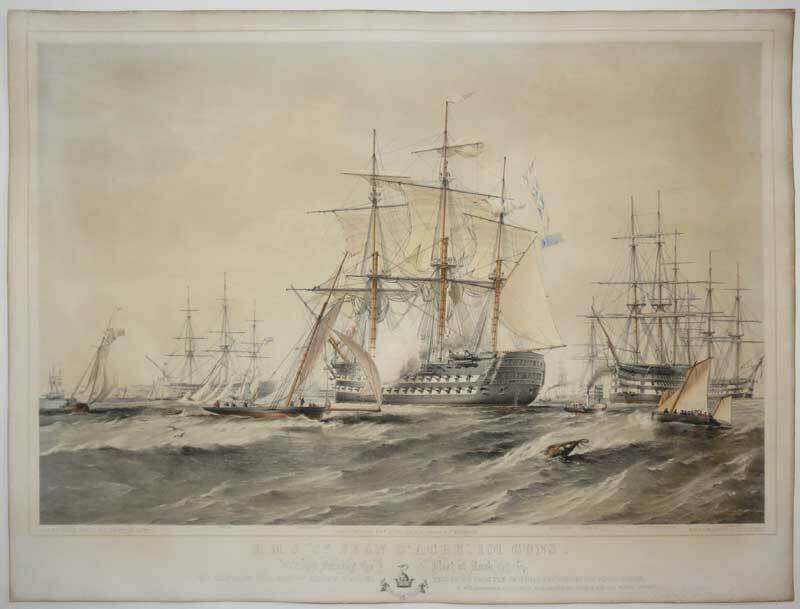 The scene depicts Jean d'Acre off the Irish coast surrounded by other ships that are named: Leopard, Queen, Prince Regent, Imperieuse, London, Duke of Wellington and Agamemnon. As such it is a fabulous evocation of British maritime strength during the early years of Queen Victoria's reign. Jean d'Acre was the first two deck warship to be commissioned by the Royal Navy with 101 guns. She was launched in 1853 and went straight into action in the Crimean War where, in 1855, she joined the Fleet in the Black Sea. Further commissions saw her in the English Chanel and the Mediterranean before being finally broken up in 1875. This print is the combination of two great maritime artists of the mid nineteenth century. Both Dutton and Brierly are considered to be the best in their field and between them have produced some of the finest images of ships from the period.